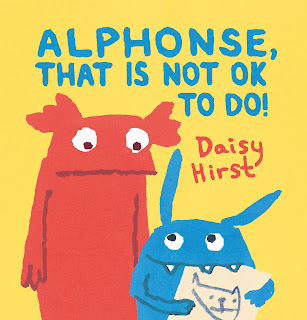 Picture Book Party: The making of Alphonse, That is Not OK To Do! Daisy Hirst tells us all about how she created her wonderful new picture book Alphonse, That is Not OK To Do! Daisy is a hugely talented young artist and writer. She won the Lara Jones award in the Macmillan Prize for The Runaway Baby and her debut picture book, The Girl With the Parrot on Her Head, was selected as The Times' children's book of the week. Find her online at www.daisyhirst.com, and on Twitter as @Deenface. I have been doodling monsters for a long time: here are some on a departmental meeting agenda at the charity I used to work for and some on my friend’s shoe. 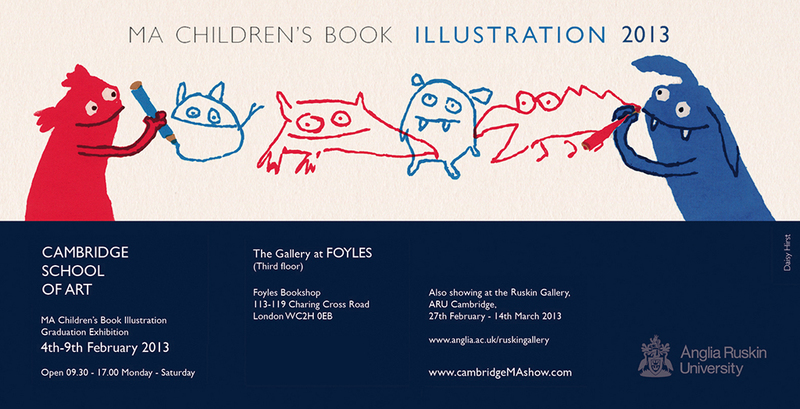 Towards the end of my MA in Children’s Book Illustration, I developed a series of monster baby books. 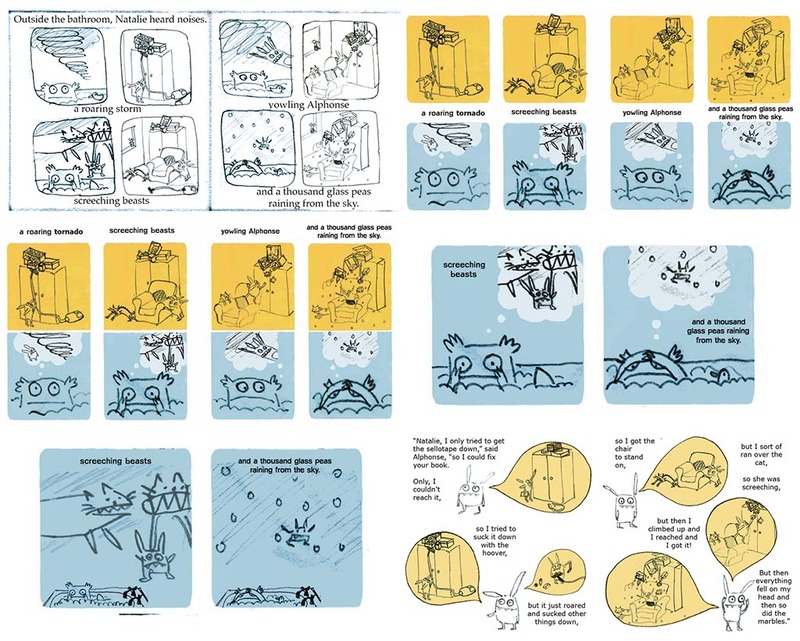 I was working on them with a publisher, but I knew there was no guarantee they would get published and tried to see the possibility of publication as just an extra spur to making a heap of new coursework – but of course it was disappointing when in the end the books weren’t made. As a way of picking myself up and carrying on I did two things: I hand-printed and bound a melancholy comic about tiny giraffes, and I made a new monster to be entered in the vote for our MA show catalogue cover. 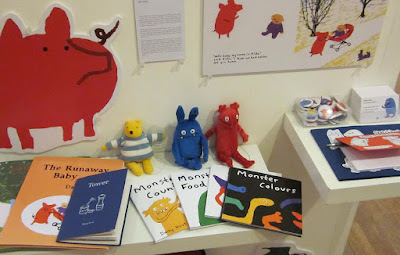 It still means so much to me that my fellow students chose the red monster. 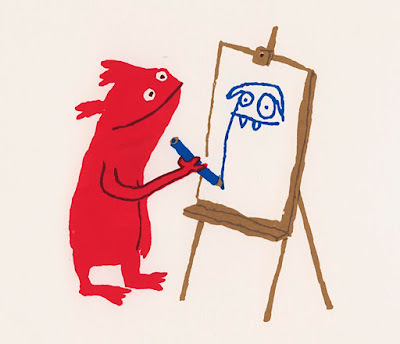 I added the blue monster painting the red monster, and a picture of them drawing together for the bookmark-invitation. The catalogue monsters were a sort of celebration of the mutually inspiring, collaborative atmosphere of the MA, and it was amazing to see them rendered in cake for our private view by Emily Wilkinson. When I made the bookmark I realized it was also a picture of me and Becky Palmer, who I was just getting to know and who is the best person I’ve ever found to make stories and pictures with. 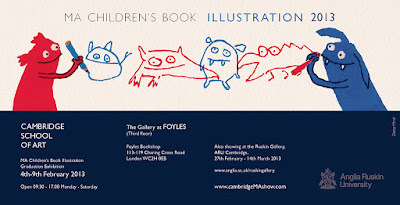 Walker liked my monsters, and we hoped to make a monster book after The Girl with the Parrot on her Head – a picturebook rather than a baby book and probably featuring the catalogue monsters. I can’t say these monsters grew into Natalie and Alphonse, as when I came to develop them into picturebook characters they got younger: I suppose they shrank into them. 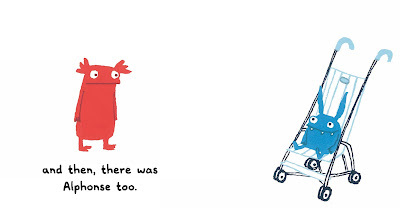 As with most of my stories, I developed Alphonse, That Is Not Ok To Do! through doodling in my sketchbook, drawing the monsters hundreds of times to see what they might get up to. But the seeds of the story were there in the original set of images: I already felt that the red monster was more serious, the blue monster a bit of a liability (albeit an adoring one). This is the most collaborative book I’ve made, as my brilliant editor and designer were involved from before there was even a story. Hopefully it doesn’t show, but it was also a very difficult book to get right. At first I thought it would be about Natalie drawing herself a brother, who then materialises; there was also a babysitter called Mrs Arlene who got everything wrong, poorly-received toast-art, and a subplot about snails that I clung onto for months! 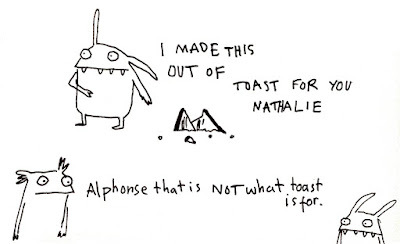 In the end we realized that the heart of it was the relationship between Natalie and Alphonse – not where he came from or what else might be wrong with the world. I despaired of myself: how had I taken what was supposed to be a funny, simple, story for a very young audience and made it so complicated? Why did it need a parallel narrative of the ‘meanwhile, on the other side of the forest’ variety? Such shenanigans are uncommon in picturebooks for a reason! 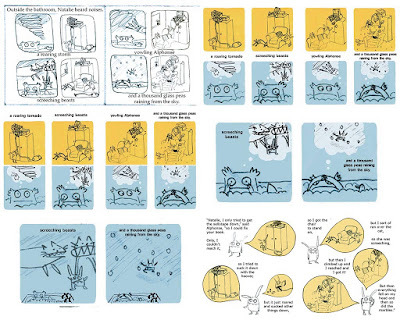 After months of storyboarding, making the artwork was (mostly) wonderfully straightforward. 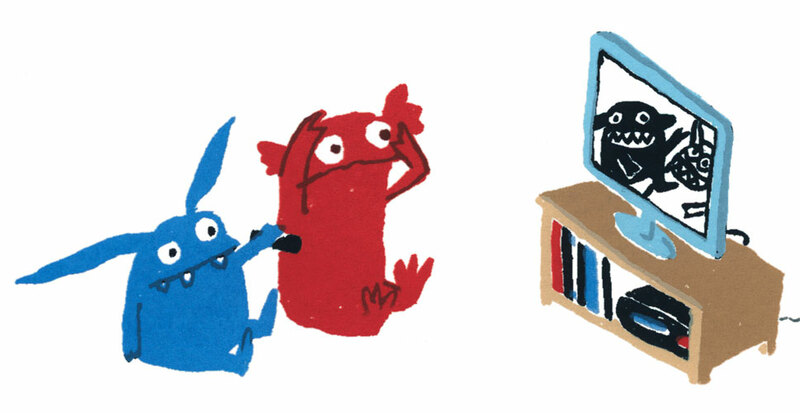 The illustrations are screen-printed, a method I'd learnt through making The Girl with the Parrot on her Head, but there's something particularly satisfying about how the bold flat-colour shapes work for single-coloured beasts with googly eyes. 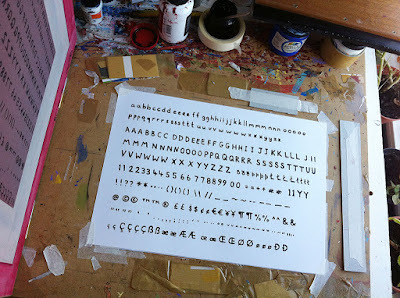 Making the font was fun: I wrote out and screen-printed upper and lower-case alphabets and a lot of other characters and accents which were fairly mysterious to me, and Walker had it properly converted into a font: WB Natalie Alphonse. Some of those mysterious characters came in very handy when the book was translated into seven languages. Thank you Daisy for giving us an insight into your artistic process! 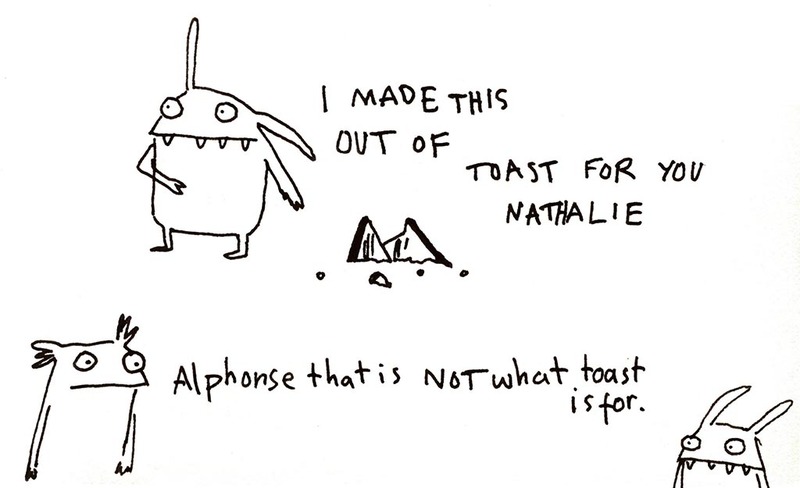 Alphonse, That is Not Ok To Do! is out now and you can pick up a copy at your local bookshop.